Gunmen attacked a bus carrying Coptic Christians in central Egypt on Friday, killing seven in the latest assault on the religious minority claimed by the Islamic State group. 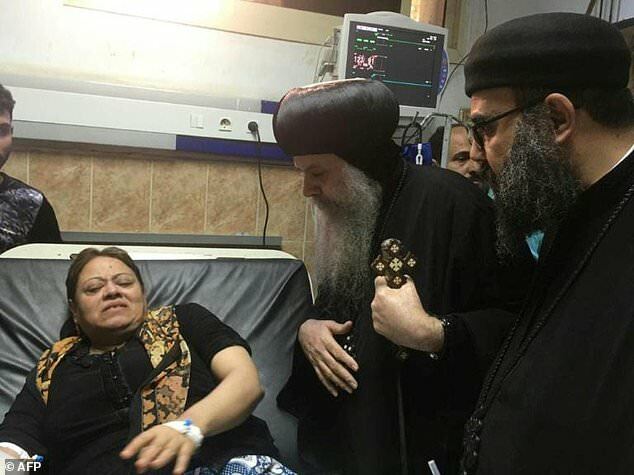 The attackers opened fire on the bus of pilgrims in Minya province after the occupants had visited the Saint Samuel monastery, the local bishop told AFP. Bishop Makarios of Minya said the wounded were taken to a hospital in Beni Mazar, around 200 kilometres (120 miles) south of Cairo. The Coptic Church in a statement released the names of the seven "martyrs" -- including two women -- who died in the attack. Heavy deployments of security forces blocked roads leading towards the scene of the shooting, an AFP reporter said. A security source confirmed that seven people were killed in the attack and said seven were wounded. The Islamic State group claimed the attack in a message via its propaganda agency Amaq. "Those who carried out the ambush... in Minya are fighters of the Islamic State," it said in a statement on the Telegram messaging app. Egyptian state television said security forces were on Friday afternoon still in pursuit of the attackers. President Abdel Fattah al-Sisi observed a minute of silence at a youth forum he was attending and called Coptic Pope Tawadros II to offer his condolences. "I am mourning with deep sadness the martyrs who fell today at the hands of traitors who are trying to harm the tightly-knit fabric of the nation," the president said in a statement released on Twitter. "I wish the wounded a quick recovery and confirm our determination to continue our efforts to fight the darkness of terrorism and pursue the criminals." Egypt's prosecutors office said it had received reports of "gunfire targeting a bus carrying a group of Copts returning from the Monastery of Saint Samuel the Confessor". The health minister and minister of social solidarity were dispatched by Sisi to Minya. Copts, a Christian minority that make up 10 percent of Egypt's 96 million people, have in recent years been repeatedly targeted by the Islamic State jihadist group. IS killed more than 40 people in twin church bombings in April 2017 and a month later shot dead 28 Christians in Minya province. Egypt's government imposed a three-month countrywide state of emergency after the April 2017 church bombings. In December 2017 an IS gunman killed nine people in an attack on a church in a south Cairo suburb. A year earlier, an IS suicide bomber killed almost 30 worshippers at a church in Cairo located in the Saint Mark's Cathedral complex, the seat of the Coptic papacy. The Egyptian army launched a major offensive in February 2018 against IS in the Sinai Peninsula, where the group has waged a deadly insurgency since the fall of Islamist president Mohamed Morsi in 2013. Alongside attacks against Copts, the jihadists have killed hundreds of soldiers and policemen in Egypt in recent years and were allegedly behind a November 2017 attack against a mosque in north Sinai that killed more than 300 people. The military offensive -- Dubbed "Sinai 2018" -- has killed more than 450 jihadists, according to an army estimate, while around 30 Egyptian soldiers have been killed during this year's operation. Egyptian authorities have also convicted jihadists for their role in attacks against Copts. Last month an Egyptian military court sentenced 17 people to death over the suicide attacks against churches in 2016 and 2017. Copts have long complained of discrimination in Egypt and IS is not the only group to have launched sectarian attacks against the community. In December 2017, hundreds of Muslims attacked a church south of Cairo that had been operating without a permit for more than a dozen years.